Help SArC paint children's lives in 2018-2019! You have supported us before to help children learn value-based Art and now it's time to do it again! We are an organisation that begins where art and imagination intersects with education. We pride ourselves to be a unique initiative striving to boost India’s childrens’ drive to learn while also encouraging their holistic development. We take it upon ourselves to educate kids from under-privileged and low income backgrounds about important values and life-skills through the expression of Art. We believe that a good education is not just what you gain from books but also what you gain from your experiences as a student. Hence, we incorporate our core values of Patience, Sharing, Gratitude, Teamwork, Respect, Cleanliness and Equality into our curriculum to mould the child’s character through the medium of art. The process of creating art in itself is a language which enables us to communicate our core values to the children. This empowers them to grow and become the best versions of themselves. We believe that many of our country’s issues can be addressed by educating tomorrow’s torch- bearers today! We are confident in the fact that empowering the youth of today will instill a feeling of self-actualisation in them, motivating them to become adults who contribute to the growth of our great Nation and society. This program is designed by former Teach for India fellow and Psychologist, Manasi Mehan, and an Art curator and Architect, Chhavi Khandelwal. Their deep understanding of the problems at the grass-root level and sheer inclination to impact the youth resulted in the Saturday Art Class. 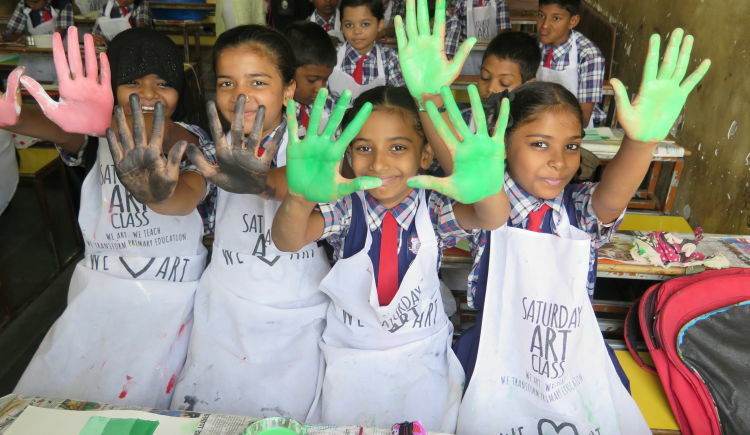 Saturday Art Class is an endeavour where art and imagination intersect with education. We pride ourselves in being a unique initiative striving to boost the drive of India’s children’s to learn while encouraging their holistic development. It is unconventional Art class for government and low-income aided school children promoting comprehensive personality development. We believe that a good education is not just what you gain from books but also what you gain from your experiences as a student. Hence, we incorporate our core values of Patience, Sharing, Gratitude, Teamwork, Respect, Cleanliness and Equality into our curriculum to mould the child’s character . The process of creating art in itself is a language which enables us to communicate our core values. This empowers them to grow and encourages them to enhance themselves. Every week, different types of art practices are taught based on the core values. Each lesson aims to make the artwork relatable to the children. E.g. Fluid Painting, SArC’s take on modern artists like- Hussain, Jackson Pollock, Piet Mondrian, Yayoi Kusama, Jamini Roy, SH Raza. Within a span of 8 months, we have expanded our impact from 30 students to 1000 students and counting. Our partner schools went from 1 to 9 schools and 1 orphanage. So far, we also have a community of 200+ mentors that help us conduct our classes on every Saturday. All the classes for this academic year are done and we now need your help to fund classes in 2018-2019. Feel free to ask Saturday Art Class for a new update on this Fundraiser. Your message will be directly emailed to Saturday Art Class and you will receive his/her response on the email address entered below.